With an all-new iteration due sometime next year, the biggest news for the 2012 Jeep Liberty is a $795 price drop on the top-line Unlimited Jet model. Although its 210-horsepower V6 and 4-speed automatic transmission merit little praise, "Trail-Rated" Liberty variants do offer both part-time and full-time 4-wheel drive systems. An industry-exclusive Sky Slider full-length opening canvas roof is optional. If you enjoy the Jeep brand but regard a Grand Cherokee as too much of a financial stretch, and the down-market Patriot and Compass seem more trial than trail, the Liberty might be your cup of green tea. And both trail-rated 4WD systems - Command-Trac II and Selec-Trac II - provide a leg-up on the Jeep Liberty's car-based competition. That said, we'd caution against overspending; as you get closer to $30K a Grand Cherokee is much more compelling in both its utility and sport. If you prefer to take your Jeep in pure, unadulterated doses, both the new Grand Cherokee and newish Wrangler deliver the goods in a far more credible fashion. In today's market a carmaker's product needs to deliver at least one thing incredibly well; today's Liberty delivers, at best, mid-level performance both on-road and off. Available in three trims - Sport, Limited and Limited Jet - the 2012 Jeep Liberty enjoys a reduced MSRP ($26,960 plus destination) for 2012, which essentially throws in the transportation fee of $795 from the previous year. New color offerings - Mineral Gray, Canyon Brown Pearl, Rescue Green Pearl, True Blue Pearl and Black Forest Green Pearl - will imbue your new Liberty with either off-road machismo or patriotic fervor. Owners are reportedly athletic and, we hope, imaginative. Most of the Liberty team's interior capital was expended on the Limited Jet, new in 2011. An attempt to provide an urban environment to this most suburban of Jeeps, the Jet boasts a 9-speaker audio system, a standard security system with side-curtain airbags, and available Dark Slate gray leather seating with accent stitching. And at Chrysler, the leather-wrapped steering wheel is becoming ubiquitous, a fact glove makers must loathe. Ultimately, the environment is adequate, storage reasonable and, thankfully, versatility intact with a generous rear hatch and folding rear seats. In its basic proportion the Liberty remains attractive, a fact highlighted by Jeep's design team and (recent) concept variants of same. A modest lift and more aggressive off-road rubber make a tremendous difference in the Liberty's stance and athleticism. Regrettably, on the showroom floor the Liberty's mass overwhelms the rubber, while brightwork places the visual elements in a neither-fish-nor-fowl stylistic quagmire. We will, however, offer a round of applause for the Liberty's Sky Slider full-length sunroof. If out in the great outdoors, this is a beautiful way of sharing its greatness with your passengers. The Jeep Liberty suffers a platform whose time and market have come and gone. Those wanting a true off-road platform can look to Jeep's own 4-door Wrangler, while those preferring urban comforts and on-road composure can opt for numerous car-based crossovers from Honda, Toyota, Hyundai, Kia and (even) Jeep. That said, if the Liberty's combination of towing and off-roading maintains an appeal, you'll not be disappointed by the Liberty's on-road composure. It is ultimately more awkward than the new Grand Cherokee, and its ride suffers when compared to the Wrangler Unlimited, but within the context of a dual-purpose SUV the Liberty is inoffensive. For the few prospects truly interested in a new Liberty, that dynamic - or lack thereof - will probably suffice. Buyers aren't exactly lined up for this particular Jeep recipe (whereas the remodeled Compass is, comparatively, standing room only), so you should expect little in the way of price increases, and increasingly generous incentives as the Liberty works its way toward an all-new replacement. Our Sport 4x4 has a base of roughly $26,000. With the aforementioned options - Skid Plate Group, Trailer Towing package and Popular Equipment Group - the total came to $28K. Subtract the $2,500 regional incentive in effect at the time of this report and you're left with a transaction price prior to negotiation of approximately $26,000. Before negotiating, check Kelley Blue Book's Fair Purchase Price for a reliable indicator of what consumers are paying in your market area. And plan on investing in your Jeep Liberty for the long haul, as short-term resale figures are woefully below those of its immediate competition (Nissan Xterra, Honda CR-V and Toyota RAV4). Thankfully, the Jeep Liberty is built for the long haul - and hauling. The 2012 Jeep Liberty remains, thankfully, a box. And while its 4,000-plus pounds effectively mask any real efficiency, there's a lot to be said for 26 cubic feet of storage behind the rear seat, and some 62 cubic feet with the rear seat folded. Beyond that, 4-wheel disc braking is a benefit, as is a standard V6. And despite its inadequacies, the V6 constitutes a blessing when compared to the lackluster fours of the Patriot and Compass. 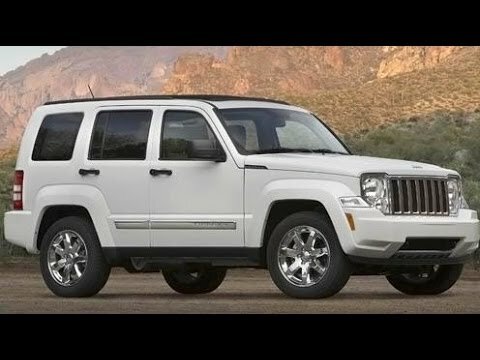 The 2012 Jeep Liberty may not be a Wrangler, but with Selec-Trac II (featuring full-time AWD, 4WD Lo and a rearward-biased torque split) and an optional Sky Slider sunroof, it can come very close to duplicating Wrangler fun - if not its functionality. If opting for 4WD, it also pays to buy some extra protection in the guise of Jeep's Skid Plate Group, too cheap at a suggested retail of $225. And we also elected to check the Trailer Towing box (which includes a 2-inch receiver hitch), given the Liberty's 5,000-pound towing capability. Finally, in our demonstration build we popped for the Popular Equipment Group (includes roof rails, cargo cover, foglights and 225/75R16 rubber) because it's popular. If there remains one compelling feature in the Jeep Liberty menu, it is the continued availability of the Sky Slider Full Open Roof. A canvas roof that opens in much the same way as a sunshade, the Sky Slider fully retracts, opening the roof for both front and rear-seat passengers. As one longtime Jeep enthusiast noted, to enjoy the outdoors you need to see the outdoors; few things allow a better appreciation of outdoor scenery than the Sky Slider. And at just $1,200, it is less than one-third the cost of Fiat's up-charge for the 500 Cabriolet. This electronically controlled full-time 4WD system provides the driver the choice between 2WD and full-time 4WD (Auto). When 4WD is selected, Selec-Trac II distributes torque to both front and rear axles in virtually all road - or off-road - conditions. And for those with motorhomes, Selec-Trac II's neutral mode allows flat towing. For under $500, why wouldn't you? Selec-Trac is a registered trademark of Chrysler LLC. Strapped with the underperforming 3.7-liter V6, there is no joy in Jeepville - the Liberty product planners have struck out. With an additional six cubic inches of displacement when compared to Jeep's new 3.6 liter, the Liberty lump delivers 80 fewer horsepower! To its credit, the torque deficit isn't that extreme (235 for the 3.7 versus. 260 for the 3.6), but that doesn't make the logic any more, uh, logical. Obviously, Jeep execs don't want to spend the dollars to reengineer this platform for a new powerplant. Their hesitancy to invest should on some level guide your decision to invest. Finally, the horsepower deficit isn't helped by last century's 4-speed automatic propelling this century's 4,000-plus pounds. Give us an extra gear here! Now in its second generation, today's Jeep Liberty - despite modest enhancements for 2011 - isn't feeling the love from its design team at Jeep. As the successor to the now-iconic Cherokee (with heads bowed, we pause to reflect the good times we had...) both first and second generations of the Liberty may seemingly offer more luxury and refinement, but the Jeep fan base notices little beyond their expanded mass. Compounding the weight gain is virtually no ground clearance, and to fit true off-road-rated rubber you absolutely must lift the vehicle. The above "good" news is marginalized even further by the 3.7-liter V6 retained by the Liberty's product team, when every other RWD Jeep has been graced with the company's vastly better 3.6-liter six. An all-new Liberty replacement is reportedly due within the next two model years - and we can't wait. Generations of Jeep safety & dependability. I purchased 3 different Jeep liberty vehicles in the past 15 years. They are dependable, sturdy, easy to drive and very rarely have mechanical issues. My last Jeep liberty had 137, 000 miles on it when we traded it in. When I purchased my current Jeep liberty I did not bother to test drive her. Yes, I name all my Jeeps, they are of course women. My husband and daughter also own Jeeps. We continue to purchase Jeep products because they are safe and dependable in all kinds of weather and road conditions. Our experiences with Jeep dealerships throughout the years have been awesome, even when we were 900 miles away from home. My next vehicle will be a Jeep but not a liberty because they are no longer manufactured. So I suppose I will need to test drive my next Jeep before I name her. The most luxurious common vehicle out there. I love my vehicle. It is easy to drive, has smooth braking, nice leather seats and good gas mileage. I feel like it is easy to use, and the only problem I have ever experienced was low tire pressure issues, where my sensor continued to go off despite my tires all having perfect tire pressure. I had to take the car into the shop to have them work on the sensor. Other than that it has worked quite well for me in the cold weather, and the 4 wheel drive is incredibly nice to have, especially since the snow in Illinois can be difficult to drive in. I am a big fan of Jeeps and would highly recommend this model to any family member or friend interested in buying a car. This car overall runs well, smoothly (if you take care of it), but it prone to issues if you don't keep up on regular maintenance like tire rotations and oil changes. It works great in snow (if you know how to drive in snow), and up until my moon roof broke a month ago, I haven't had any real issues with it in the 3 years I've owned it. Seeing as how they no longer make the car with the full retracting moon roof as mine has, the part to fix it is very hard to come by.